Landana 1000 DAYS. An extra-old Dutch masterpiece! Landana 1000 DAYS. An extra-aged Dutch masterpiece! Landana 1000 DAYS is the jewel in the crown of Dutch Gouda cheeses. Landana 1000 DAYS is made using only the very best, carefully selected Landana cheese that is left to ripen naturally for 1000 days. The specific temperature, humidity level, and the care and attention required to produce this premium product are a closely guarded secret, ensuring a unique, top-quality cheese. Only under these ideal ripening circumstances can the best quality be guaranteed. During its 1000-day maturation period the cheese loses almost 25% of its original weight, resulting in a wheel with a weight of only 19.84 lbs. (9 kg). The flat and round shape of the cheese ensures an even maturation. During the ripening process the cheese is treated and turned with the utmost care by the cheese master. Samples are taken and the cheese is inspected regularly to check that it is ripening according to plan. This 1000-day process of intensive ripening and care – ‘affinage’ – culminates in a full flavored, highly refined, mature cheese. The cheese has a warm, golden color, similar to the color of caramel. 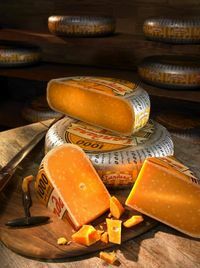 Landana 1000 DAYS is the jewel in the crown of Dutch Gouda cheeses. The small white spots in the cheese are fine mineral and protein crystals, which are the visible signs of its masterful maturation. Its consistency is solid, crumbling slightly when sliced. Before Landana 1000 DAYS gets its silver label, the cheese master turns every wheel by hand once again, to be sure that only the best cheeses leave the cheese warehouse. Landana 1000 DAYS is ideal for any cheese board, perfect when accompanied by a complementary wine, such as a refreshing Sancerre or a barrel-fermented Barolo. Coarsely flaked or cut into small cubes, Landana 1000 DAYS is also wonderful in salads. As a result of its intense taste this cheese gives many dishes an extra tasty touch. The best way to store Landana 1000 DAYS is in a cheese dome at about 54° F (12° C). You can also save it in the bottom drawer (crisper) of your fridge. Landana 1000 DAYS should be removed from the fridge half an hour before serving. At room temperature the harmonious range of flavor notes can be enjoyed to maximum effect.